RIESTS AND DEACONS who sing energize the liturgy deeply in two ways: 1 • They encourage external participation, which fosters unity. 2 • Their singing cultivates interior prayer. While the latter is often acknowledged for its elevation of solemnity (hence the Principle of Progressive Solemnity) the former is often overlooked. I thought some happy and modern music is the best way to energize the crowd? Well, that is the quick and easy way to do it. (Yes, there are excellent modern works that are energetic and sacred.) But does the music in question plant lasting roots? Energizing the “crowd” – wait – I mean the congregation – the faithful who are assembled to celebrate the sacred mysteries – can be done in such a way that leads us to the true living water and not to a “quick buzz” in which we will be thirsty again. Today I will share with you two stories, both born out of an awkward juxtaposition of inappropriate surroundings but thankfully edified by the grace of God! WAS PRIVILEGED TO HEAR Maestro David Hughes tell a story about directing his children’s schola at World Youth Day in Madrid in 2011. (Those of you who know Mr. Hughes know that his musical brilliance is matched by his extraordinary wit.) He struck the truth regarding proper time and place and the intuitive sense of mystery and awe possessed by the youth of the world. Mr. Hughes described a stadium of fifteen thousand of people listening to “house” music pumped in at decibels louder than O’Hare International Airport. The Great Schola Master began to demonstrate one of the selections by rapping (with appropriate hand motions) “THERE’S NO PARTY LIKE A CATHOLIC PARTY, ‘CAUSE A CATHOLIC PARTY HAPPENS ALL THE TIME…” You haven’t truly lived until you’ve heard David Hughes do rap and hip hop. 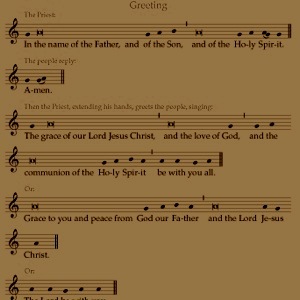 But….once the mass began, the children began singing the Gregorian Introit, and fifteen thousand young people immediately stilled to complete silence while the English and Latin texts lit up the JumboTron. Silence was not submission, but an energy and aura of entering the loving embrace of Christ’s love in the Eucharist – the Sacred Mysteries. OME OF YOU KNOW my wife recently had a baby and we are deeply blessed with our third child. Needless to say, things are a bit hectic around our household. Furthermore, between Boston College and St. Cecilia Parish, I am responsible for about a dozen or more sung liturgies per week. So, Monday is usually a relatively slow day. I was moving furniture and painting a desk for my oldest daughter. As my schedule became rather compressed, I had little time to clean up before a noon mass at Boston College. I think there was paint in my hair. I know there was on my pants. I was a mess. No big deal, I can hide most of my appearance in the back and Fr. Cyril Opeil, a physics professor who studies “condensed-matter experimental physics, single crystal uranium, martensite alloys, ferroelectric materials and thermoelectrics” according to his website, would not be too worried about a slightly disheveled organist. What could possibly go wrong? So as I walked in, who was the celebrant? Apparently, the good Jesuits at this veritable institution of higher learning neglected to tell me something. It was none other than my co-blogger, Andrew Motyka’s boss Archbishop Joseph William Tobin C.Ss.R of Indianapolis. He had been invited by Boston College to speak on “Church as Communion” as part of BC’s “Our Episcopal Visitor” series. WAS MORTIFIED because I had to confer with him in the sacristy on a few liturgical items. I learned quickly he is a wonderful proponent of sacred music. He asked if I would be attending the Sacred Music Colloquium Andrew Motyka was hosting in Indianapolis. Then we spoke of Andrew’s creative brilliance, and we had a good laugh over the paint in my hair. There was no danger of me making a good first impression. He can tell you the truth of my appearance. I did not lead by example that day. Then the simple Monday mass of the Third Week in Lent began with the sung sign of the cross. It continued with other sung dialogues. Whether with his deep baritone voice or his gentler head voice, the bishop’s singing clearly energized the mass. His singing rubbed off on everyone. The psalms and hymns were sung with greater robustness. Everyone certainly felt the energy in this liturgy without and within. Furthermore, Bishop Tobin clearly knew his ICEL chants, which the congregation also sang very well. Everyone left understanding, consciously or not, the value of singing the mass as opposed to simply singing their favorite songs at mass. 1 • External participation, which fostered unity. 2 • Heightened interior prayer. Especially now as we continue through Lent, we need to look at our interior prayer life to see where we can become better people. In addition, we need the support of our brothers and sisters – and God – to do it. For your study and enjoyment, here are recordings and practice videos of the St. Cecilia Office of Divine Worship Schola singing the ICEL Chants at St. Cecilia Church in Boston. This also includes Fr. Gaspar singing the priest’s parts of the recording the ICEL Chants as well as the Exsultet. Fr. Jonathan Gaspar is also the Director of the Office of Divine Worship for the Archdiocese of Boston. Additionally, he is an organist, singer, and a great advocate of Gregorian Chant. In 2011, he formed the Office of Divine Worship Saint Cecilia Schola in which we collaborated on recording the ICEL Chants of the Roman Missal, Third Edition. Listen and watch here to Fr. Gaspar’s practice video of the Easter Proclamation.